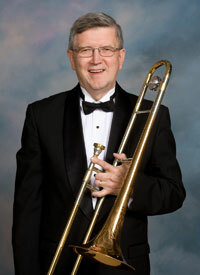 John Smith has been a member of the Kishwaukee Symphony Orchestra since 1979. He holds B.M. and M.M. degrees from the University of Iowa and is a retired DeKalb band teacher. He has a varied music background including playing with the Quad City Symphony Orchestra, the Rockford Symphony Orchestra, pit orchestras for musicals, and church orchestras. And he has been a member of the DeKalb Municipal Band since 1967. He has been a member of the American Federation of Musicians since age 16 and is currently a member of Local 10-208 of the Chicago AFT.